We have some extraordinary houses to hire in the South East of England. All of them are available for exclusive-use hire and have their own unique charm and attractions. Fancy the magnificent Cornwell Manor in rural Oxfordshire? Or Waterside Manor in Sussex, with lake views and a hot tub? In Northamptonshire, we have the beautiful Mears Ashby Hall, which sleeps 20 people in luxury. Alternatively, for a larger house with more extensive grounds take a peek at Oxon Hoath in Kent which sleeps up to 50. It even has a dance studio and 73 acres of parkland. For the real country estate experience, why not hire an estate to yourself? 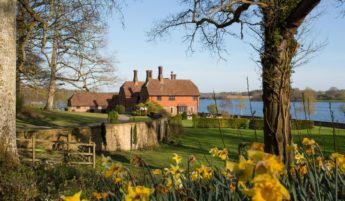 At Pekes Manor in East Sussex, you can hire the main house and surrounding cottages for your party’s exclusive use.